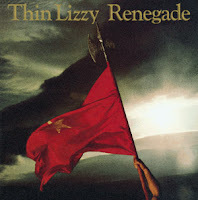 Other than the songs ’Jailbreak’ and ‘Boys Are Back In Town’, Thin Lizzy’s “Renegade” album was my real introduction to their music in the early 80s. Oddly enough, it wasn’t until around 1997 or 1998 that I really gave them a proper listen. Thanks to Danile’s older brother Jon (Poo-Poo), I was introduced to the opening track from this album entitled “Angel of Death”. Of course we all thought it was cool because it had death in the title. But overall, this album is phenomenal and really showed another step into the metal direction that Lynott wanted to take. I generally don’t give song by song reviews but I will for this album. It deserves it. Angel Of Death – This is such a dark haunting tune with some really great lyrics. Phil was a great storyteller and this is one of his best. It’s sort of about Nostradamus I guess. I love some of the lines in this song like “I’ve seen Hitler’s storm troopers march right across the Maginot Line”. It’s a great song. Renegade – The somber, sullen Thin Lizzy ballad. Again, great lyrics by Phil. Great little double guitar harmonies in this one too. When I still had my Harley, the above lyrics were always in my head. The Pressure Will Blow – Not one of my faves from this album but surely not a stinker. Great double guitar work. I do like Brian Downey’s drumming on this one a lot. Leave This Town – I simply adore this tune. I really think Phil was singing about his drug and alcohol abuse in this one which he often did. This is played with an upbeat shuffle much like “Don’t Believe A Word”. It also rang true for me a bit when I was deciding to move out of Norfolk. Hollywood (Down On Your Luck) – This is a rocker. I’ve read a lot of reviews where people don’t like this one because it’s too commercial sounding. It would have made a good radio song for sure. Simple riff, catchy lyrics but it just cooks. The 80s metal band Sound Barrier did a cool version of this as well. No One Told Him – This is an upbeat rocker with rather sad lyrics. “You didn’t didn’t tell him you didn’t want to see him again”. It’s basically about a guy who gets dumped pretty hard and just gets way down on his luck, gets kicked out of the bars and just becomes a hopeless wreck. Great song. Fats – This is one of the only songs by Thin Lizzy that I never really cared for. Other than the fretless bass work on this, I just don’t like it and usually skip it when it comes on. Mexican Blood – This song rules. Period. It’s basically the rock version of Marty Robbins’ “El Paso”. But it’s great. The passion in Phil’s voice always gets me. He was great at phrasing his lyrics. It’s Getting Dangerous – Love this song. Some of the lyrics hit close to home as well. That’s one of the things about Phil’s writing; it always seemed to make sense to me. Typically when someone asks me to recommend a Thin Lizzy album to them, this is usually in the top 3.